Growing up in Fort Wayne, Indiana, Jalyn Radziminski did not experience everyday dialogues about the structural impacts revolving around race and difference. “In the Midwest, race is not as amplified and, in my personal experience, people were quick to shut down challenging conversations about race,” says Radziminski, who is of African American, Japanese, Polish and Native American descent. At Emory, those conversations came to the forefront, which she at first found difficult, but soon embraced. Now, as the 2018 undergraduate recipient of the Marion Luther Brittain Award, Radziminski becomes the first black woman, the first Japanese woman, as well as the first first-generation college student to receive the award. The Brittain Award is presented each year to two graduating students, one graduate and one undergraduate, under provisions of a gift by the late Dr. M. L. Brittain, former president of the Georgia Institute of Technology and alumnus of Emory. “Every group I’ve been in, everything I have learned and experienced at Emory, has helped shape me as a human being. It all felt natural to me,” says Radziminski. The list of her experiences is long: student athlete; Emory Jazz and Wind Ensemble musician; student activist; 1915 Scholar; founder and outreach chair for the Black Mental Health Ambassador Program; council member of the Mental Health American Collegiate Innovation Council; Benjamin A. Gilman Scholar; 2017 Humanity in Action Fellow; and president of the Alpha Nu chapter of the Theta Nu Xi Multicultural Sorority. All of this while excelling academically as a linguistics and interdisciplinary studies major with a focus on human and civil rights. Radziminski is a “trailblazer” and “social justice pioneer” who “continuously strives to do more, try more and be more,” notes Krystyna Jordan, program coordinator in the Office of Student Success Programs and Services, who nominated her for the Brittain Award. During her first year at Emory, Radziminski pursued what felt familiar to her, running track and cross country. But seeing a performance of the Issues Troupe, a social justice improv group, changed the course of her college experience. “It really opened the door for me to do social justice work. I latched onto the organization and really embraced the opportunity to support social justice and human rights through different forms of expression,” she says. 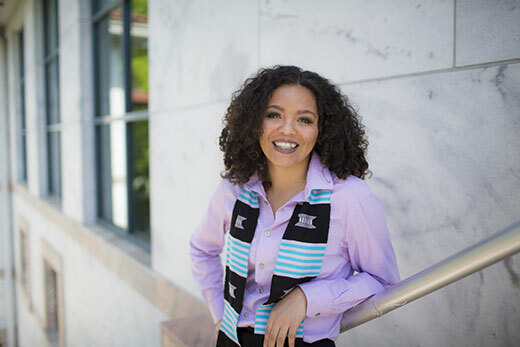 In her sophomore year, Radziminski took the opportunity to advocate for social justice through the Emory Black Student Demands, a movement of students striving for greater recognition of the unique experiences of black students on campus. While embracing her role as a student activist, Radziminski was acutely aware of the psychological toll that accompanies striving both to excel in the classroom and devote personal time to lead student organizations and advocate for student causes. “I felt myself getting very drained and I started getting depressed. I recognized that many other colleagues were experiencing the same thing. I didn’t grow up knowing about mental health or activism fatigue,” she says. To counter the negative feelings she was observing and experiencing, Radziminski created the Black Wall of Love, an art installation that displayed messages of love and affirmation for her fellow students, and brought together staff, faculty and students to engage in dialogue about change. That project evolved into the Black Mental Health Ambassadors Program, a program that advocates for black undergraduate and graduate students in relation to mental health she helped found in partnership with the Office of Counseling and Psychological Services in Campus Life. Another group that was influential to Radziminski is the 1915 Scholars Program, which is designed to provide a support network for first-generation, low-income college students who otherwise might struggle with the transition to college. Part of the first cohort of 1915 Scholars, Radziminski says she benefitted both from the mentorship of faculty and staff and from the experience of mentoring students who came after her. “There are things that some students might think of as common sense on how to deal with pressures when they get to college, but it’s not common sense if you don’t have someone to tell you about something you don’t know,” she says. Radziminski also helped start the Multi-ethnic Racial Group at Emory (MERGE), an organization designed to support students of multiracial identity and promote unity. In Theta Nu Xi, Radziminski found an organization that celebrated and supported multiculturalism without negating individual communities. In 2018, Theta Nu Xi hosted the 2018 Girl Up Leadership Summit at Emory, a program of the United Nations Foundation’s Girl Up campaign that engages adolescent girls around the world to take action in their communities and advocate for themselves and for girls in need. The summit brought young women of color from all over the nation to Emory, and Radziminski led tours of Emory’s campus for participants. Radziminski says the Brittain Award will allow her to pursue an advanced degree, but she is taking a gap year to work and decide what academic path she will take.